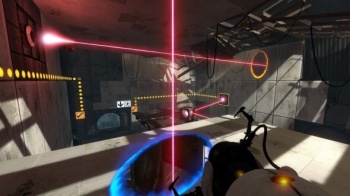 Valve says Portal 2 could be the developer's last single-player experience of its kind. Geoff Keighley's Final Hours of Portal 2 iPad app, which includes all sorts of background information and assets related to the 3-year development of Portal 2, divulged the possibility. It includes a statement that says: "Portal 2 will probably be Valve's last game with an isolated single-player experience." Keighley writes that this information "comes from Valve" and wasn't dreamed up out of nowhere. He adds: "Keep in mind Valve said 'probably,' so I get the feeling that this could change." The statement could have many meanings. First of all, it hints that this is the end for the Portal series, which despite a co-op mode in Portal 2 is inherently a single-player game. However, it doesn't mean that Valve is going to stop creating single-player games entirely, just games with what it deems an "isolated" single-player experience, meaning that other players might at least have the ability to jump in through a co-op feature or some other method. It's definitely an interesting statement to think about considering how Valve is still working on the next iteration of the Half-Life series, which is also a single-player experience. Perhaps it won't be next time? *Edit* The term "isolated" may be referring to the idea of the main character being alone in the game without NPCs, rather than actual human players, so this could be a misinterpretation of Valve's statement.